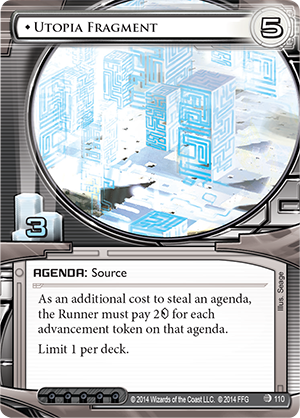 The Mumbad Cycle recently ended for Android Netrunner, and while I haven’t really talked much about the individual cycles as I do for Lord of the Rings LCG, I thought I’d do a small blog today to mark the occasion because, in my opinion, this is by far the most flavourful of all those for the cyberpunk LCG, and is definitely worth talking about! The Mumbad Cycle gives us a global view of the Netrunner universe as we move to India, on the brink of an important vote as to whether clones should be granted citizen rights within the Indian Union. Basically, the story here is that everybody is against Jinteki, the corporation that has made a fortune in the cloning process, and that “will stop at nothing to make sure their most lucrative product remains just that: a product”. There are a whole host of cards across the six data packs of the cycle that detail the storyline, one of my favourite being Voter Intimidation. 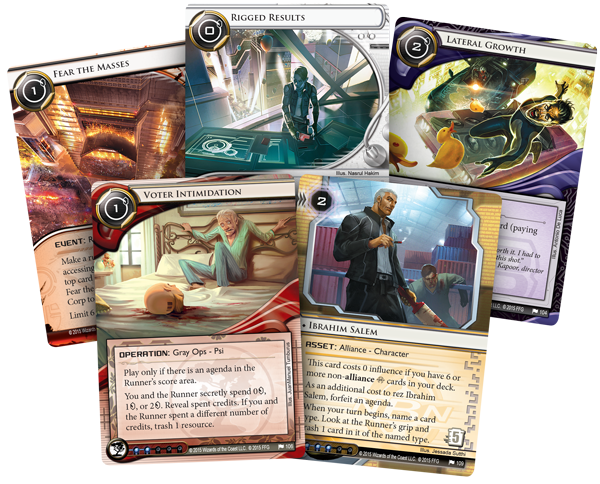 We get a lot of new great things in this cycle, including two new corp identities and two new runners, and a whole load of really flavourful cards. Part of me wonders if there is some degree of stereotyping going on here, as a lot of the cards have a very Indian feel to them, but not being myself an Indian, I don’t know if that’s a bad thing. They certainly don’t look culturally offensive, but I can’t honestly chime in on that debate. There are certainly a lot of cards that run with the Hindu vibe, though I feel this is more to establish the sense of place than anything untoward. The new cards look pretty great, anyway. I’ve been looking them over, and can see where a couple could fit into my already-established decks, while a few others might even be worth specific build-arounds. I’d just like to mention two specifically, which involve one of my favourite mechanics of the game, agenda-manipulation. Liberated Chela is a 0-cost Resource you can pay five clicks and forfeit an agenda to make into a 2-point agenda. I love how the Shaper faction seems to have this kind of theme of making agendas out of nothing! While the Corp can forfeit one of their own agendas to stop this happening, it is still pretty nice, especially if you only have a one-point agenda (or have made one out of Notoriety). “Freedom Through Equality” is another such card, and while as a Current event it is only in play until another event is played, it could potentially win you the game if played late on. Exchange of Information is an operation for NBN that allows the Corp to swap an agenda in their score area for one in the Runner’s score area if the Runner is tagged. Suddenly, losing my Utopia Fragment isn’t going to be too bad if I can get a tag on the Runner – and what do you know, isn’t that just NBN’s specialty! 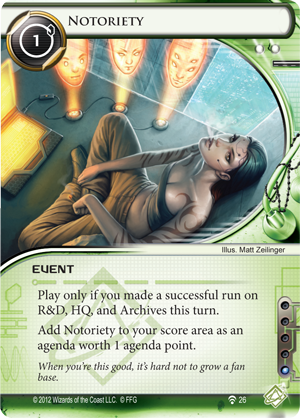 There are two notable new mechanics introduced in this cycle, one each for the Corp and the Runner. The Corp has access to some powerful new Alliance cards, neutral upgrades and assets that give your chosen Corp some distinctive advantage if you have more of them in your deck. Each Corp also has an operation and an asset that grants boons if you have less cards from outside your Corp, creating a fine line for deckbuilding. It’s an interesting idea, and one that I hope to see built upon in future cycles. Something that I think could be really nice is having specific alliances set up between the Corps, though I don’t really have any actual ideas for implementing that! 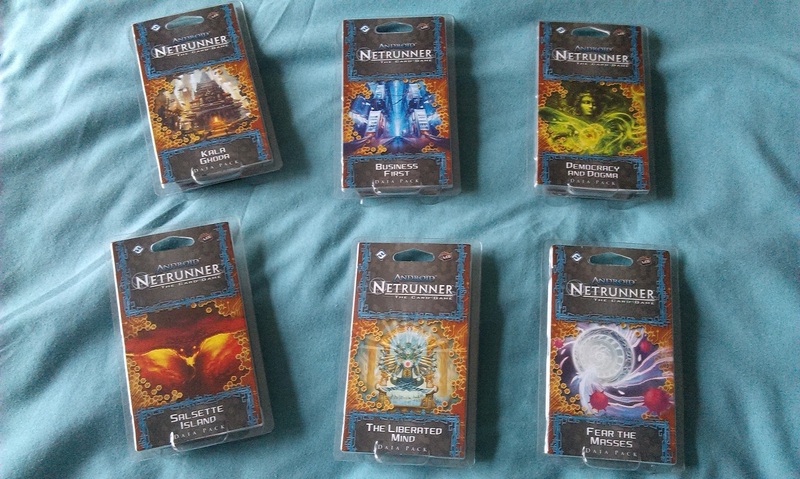 The Runner has consumer-grade tech, which breaks the deckbuilding rules by allowing up to 6 copies in a deck rather than the usual 3. I thought this to be particularly interesting as it demostrates the “relaxed technology restrictions” prevalent across the Indian Union. This rule of 6 is further used in event cards, one for each faction, that are more powerful the more copies you include in your deck. Unlike with the alliances, I think this should be something used sparingly, but it’s nice to see new stuff like this being introduced to the game. Overall, I’m mightily impressed with this cycle. 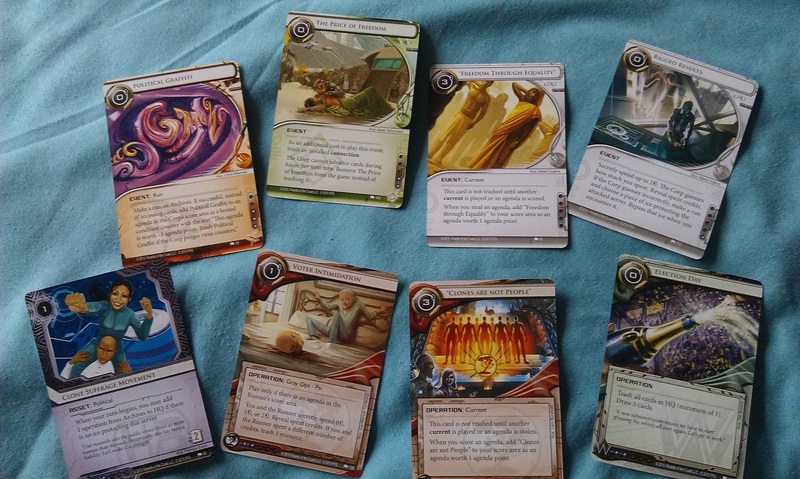 I don’t normally wait until the whole thing is over before taking a proper look through the set, but I think this time around, having paid no attention to each pack until the sixth was in my hand, I managed to get a much stronger impression of the new stuff overall. The next cycle, Flashpoint, has already had its first two packs previewed (here and here), and looks to be just as interesting, though I’m not entirely sure how they’ll manage to sustain the theme across six packs as they did so well with the Mumbad Cycle.